Drones capture a birds eye view of the ground in amazing detail but are capable of so much more when their imagery is processed using photogrammetry. 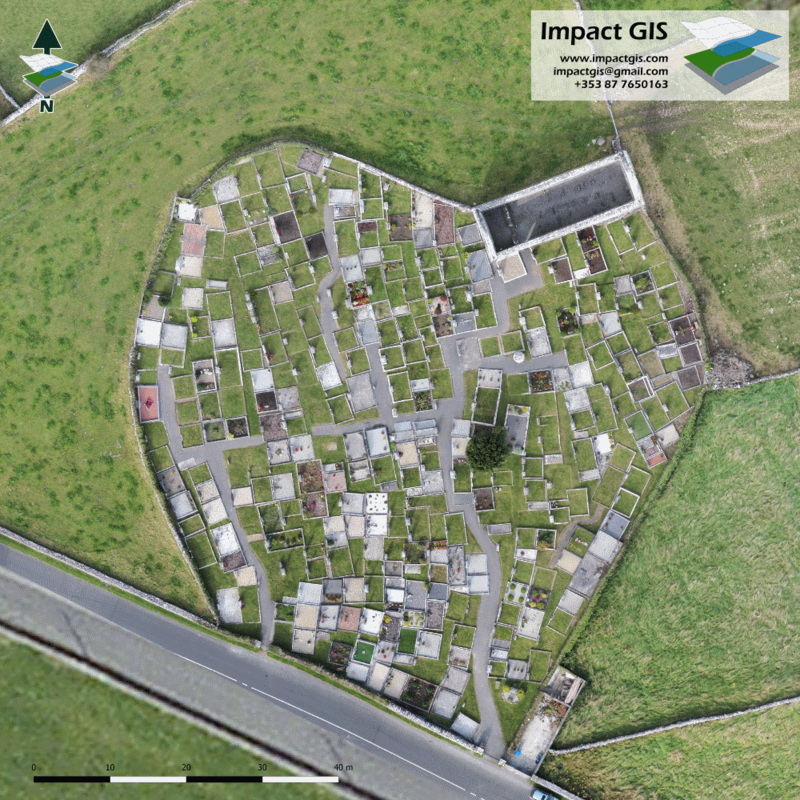 Impact GIS recently undertook a drone survey of a graveyard to inform discussions between Galway County Council and the National Monuments Service. Galway County Council are seeking to expand the graveyard and the National Monuments Service were concerned about potential impacts on an early christian enclosure associated with the graveyard. 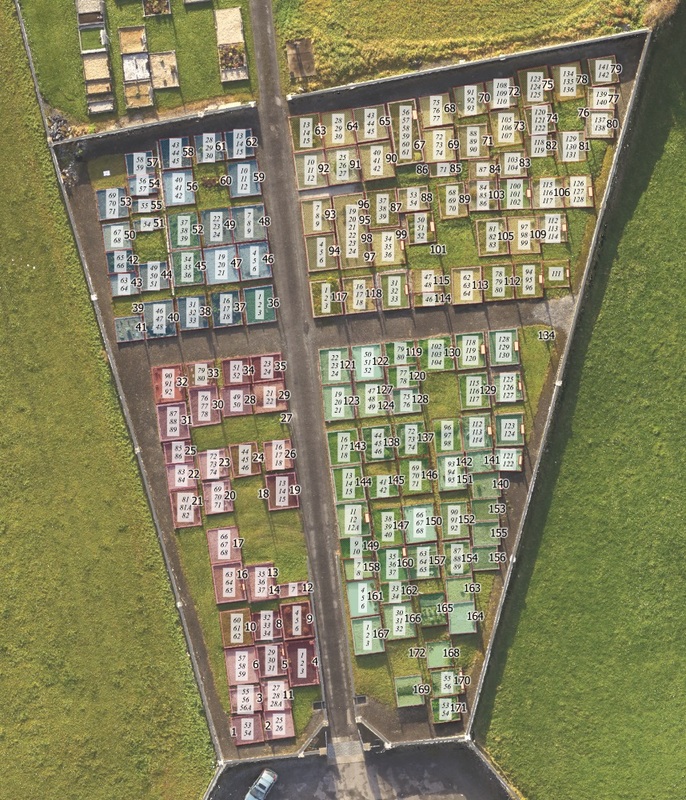 The easiest way to have a meaningful discussion about the potential impacts, is if everyone is able to visualise clearly what’s there, however a review of available aerial photography wasn’t much help. Other techniques, such as surveying profiles, require a degree of mental gymnastics to ‘see’ what is there. 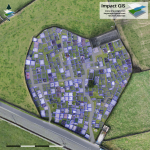 Impact GIS recommended a drone survey. Photogrammetry generates a 3D model of the ground surface (also referred to as Digital Surface Models (DSM) or Digital Elevation Models (DEM)), which can be processed using GIS software to produce a hillshade representation, where the software generates shading/shadows based on the relative position of a simulated light source. 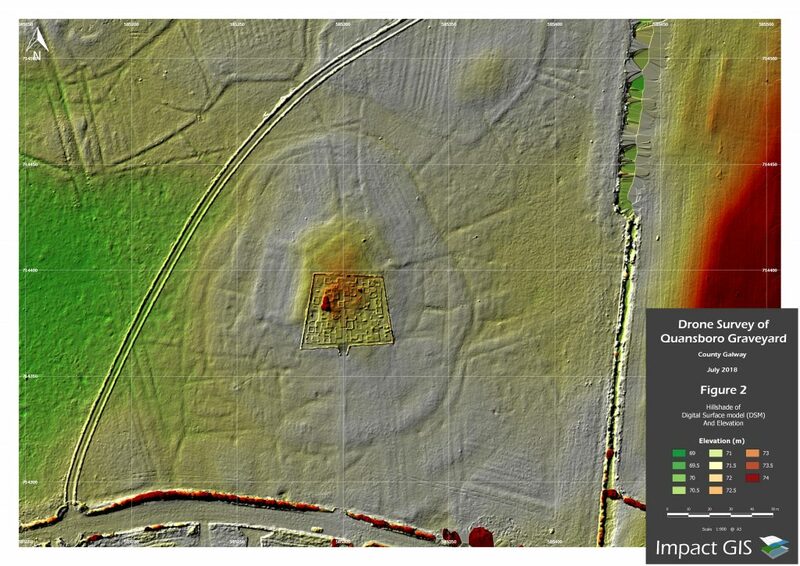 Hill shade of height model generated from a drone survey of Quansboro Graveyard and environs. Need GIS skills for taking on large scale projects? 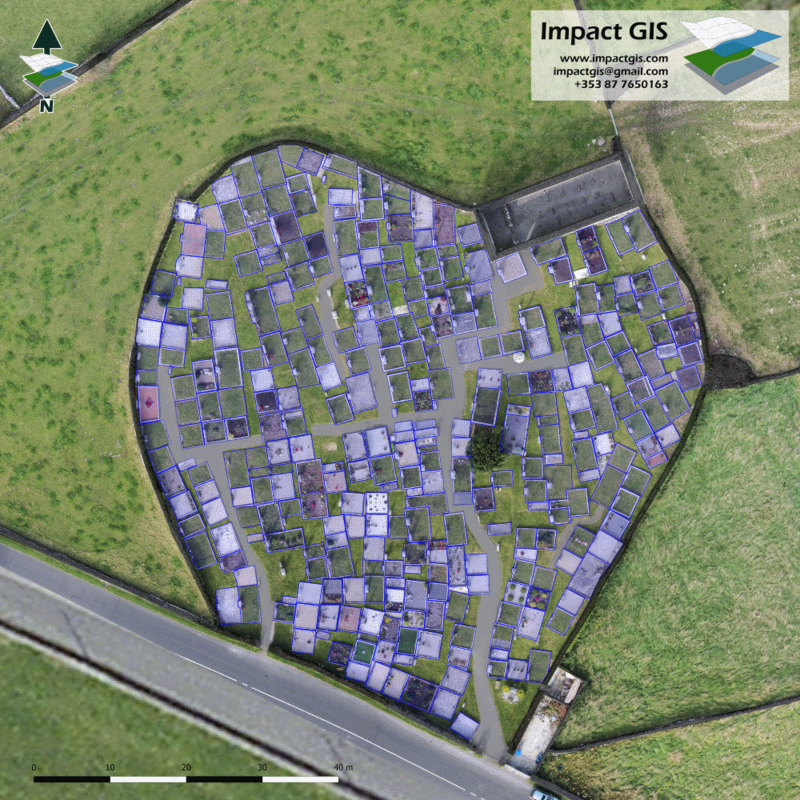 Impact GIS can help! Best practice dictates that from the earliest stages of considering a development, environmental constraints should be fully integrated with the planning process. 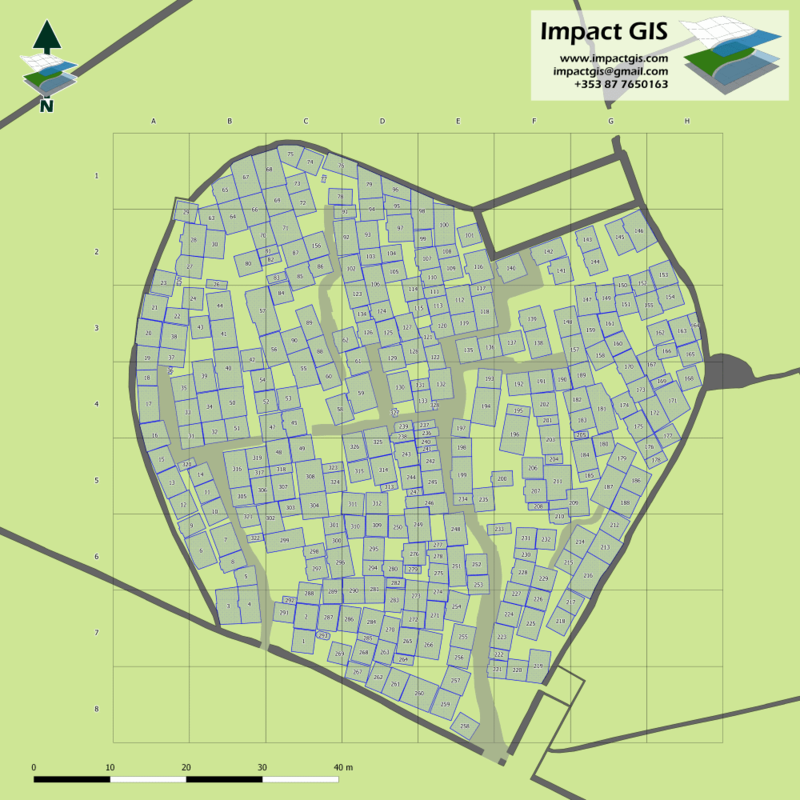 With most data sources for archaeological, architectural and cultural heritage constraints now available online, GIS mapping has become an indispensable tool for constraints mapping and the entire impact assessment process. 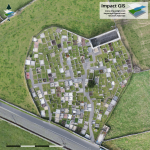 Impact GIS was recently appointed by Kilbeacanty Graveyard Committee to undertake aerial/drone surveys of two graveyards near Gort in County Galway, with a view to mapping and recording the graveyards. 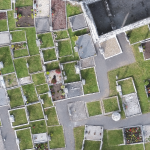 Drone surveys were undertaken using ground control points (GCP) surveyed in with a survey grade GNSS (GPS) and the imagery captured was then processed using Pix4D to produce detailed orthophotography. Extra GCPs were surveyed in to check the accuracy of the final orthophotography. A review of GCPs in the final orthophotography found their accuracy to be within 1 to 2 cm. 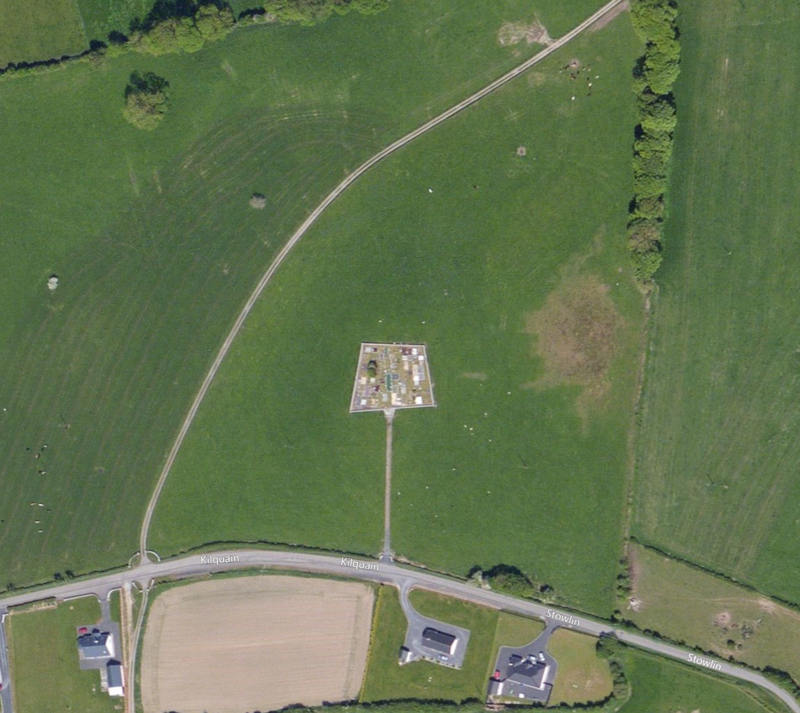 The orthophotography was imported into QGIS and used to producing mapping, the marking up features, including bounding walls, paths, grave plots, the locations of headstones etc. 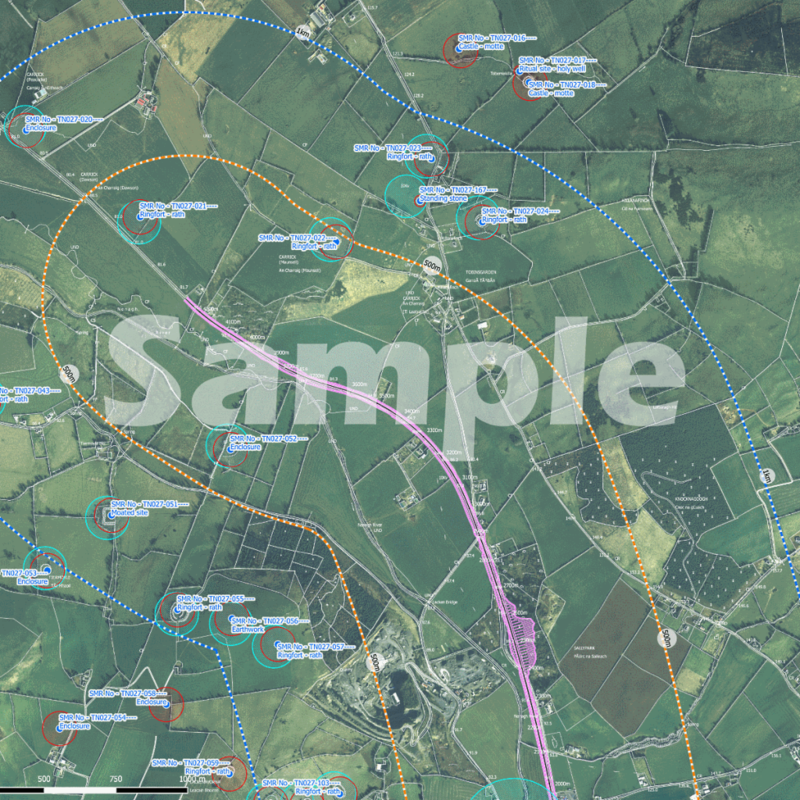 Draft mapping has now been issued to the client, who will use it to align grave numbering with previous surveys. 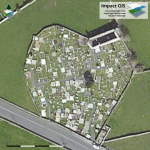 Impact GIS and Galway County Council will then host a photographic workshop, training local volunteers to undertake a photographic survey of the graves and headstones within the graveyards. 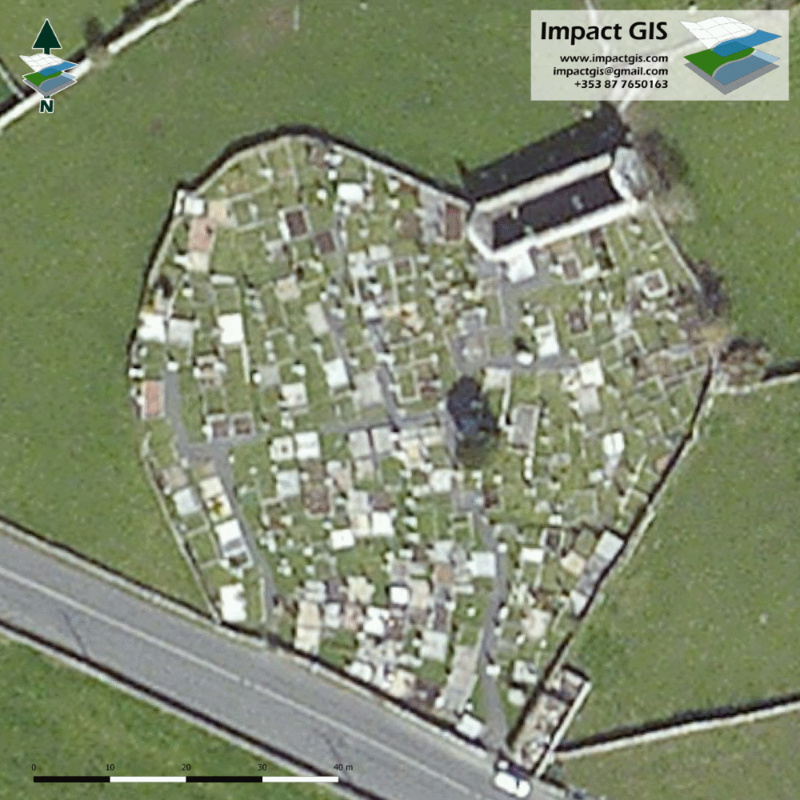 Details for all graves and memorials will be added to the GIS database and uploaded, with photographs, to Galway County Council’s Galway Graveyards website. It never ceases to amaze we what QGIS is capable of. A friend recently asked me to produce a map for a classic motorbike and car rally in aid of Movember, raising awareness about mens health issues, in particular prostate and testicular cancer, and mental health. 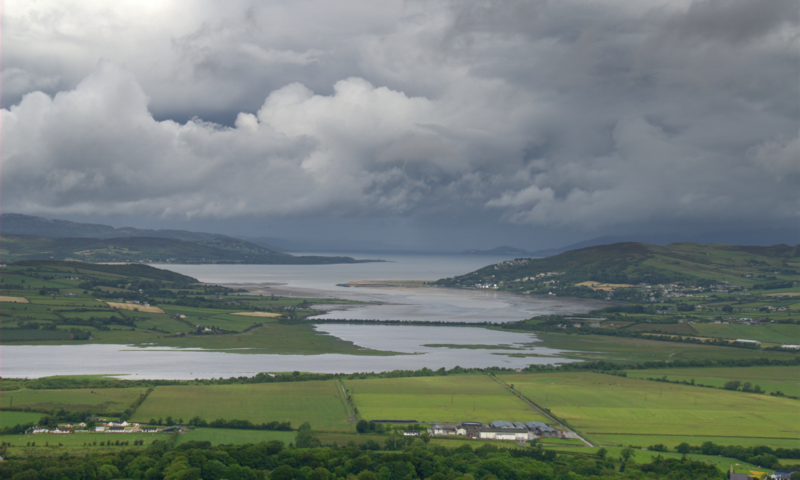 The route passes through some of the most scenic areas of the Connemara Mountains in the west of Ireland. 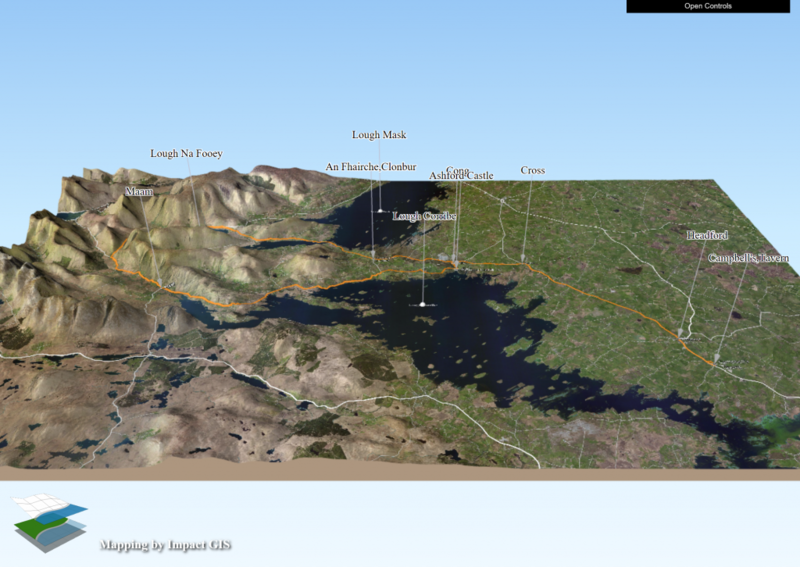 I was wondering how I could make this area come alive to people, I needed 3D, so turned to the Qgis2threejs plugin, which I have used before to visualise areas in 3D. What I hadn’t noticed previously was the ‘Output’ option, which allows you to output the HTML of the entire 3D visualisation ready for upload to the web. Click on the image below to check it out. Thanks to all the contributers at QGIS and Qgis2threejs. Impact GIS undertook a drone survey of Killirsa Graveyard in County Galway to generate high resolution orthophotography for mapping of grave plots. Grave plots were mapped using Geographic Information System (GIS) software, allowing for data associated with each grave plot to be stored in an accompanying database. See the slide show below. Firstly it is probably best to explain what a Geographic Information System is. It’s all in the name, it is as system that allows you store information which is associated with location (geographic data). 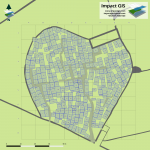 Most relevant to this project, GIS allows you to draw polygons, such as the squares and rectangles of the grave plots, and each one of these, as well as being spatially correct (in the right location), can have information about it stored in a database. So each grave plot can have the names, dates, inscriptions etc. stored and this information can be sorted, searched, filtered etc. This can form the basis of labelled paper maps, a searchable database, interactive online maps etc. Sometimes you are doing a bit of research and you come across some data and think, ‘that would be far easier to understand if I could turn it into a map using GIS’. Or maybe I’m just a bit strange. This is exactly what happened when I was looking into what the likelihood is of my broadband speed increasing in the next few years. The out come for broadband is not good, but the journey produced a map which shows just how dire the situation is for much of rural Ireland. The government have recently launched their broadband.gov.ie website as the first stage towards intervening to bring ‘High Speed Broadband’ to all premises in Ireland. Surprise, surprise the private companies or commercial interests have no interest in providing a service to rural areas. 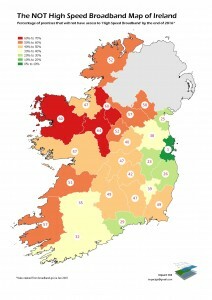 The first stage of the States intervention is to quantify the total number of premises and, of that total, how many will have high speed broadband provided by commercial operators by the end of 2016, the State is proposed to intervene and install high speed broadband for those premises that don’t have high speed broadband by then. All the data is presented down to townland level on the website, but for purposes of the map below I have used the county data. The results are enlightening! Worst off is County Roscommon, by the end of 2016 a staggering 64 percent of premises in the county will not have access to a high speed broadband. Not so surprising, is that 99 percent of people in County Dublin will have high speed broadband by the end of 2016. Overall approximately 31 percent of all premises is Ireland will not have access to high speed broadband by the end of 2016. Give Dublin’s size, it skews the data for the rest of the country, the reality is that by the end of 2016 over 42 percent of premises outside of County Dublin will still not have access to high speed broadband. The map below was produced using QGIS.